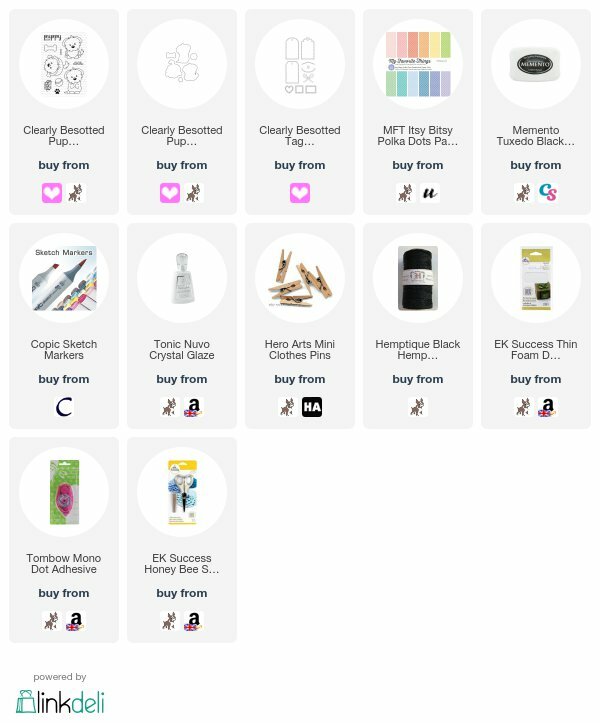 The Card Grotto: You're Pawsome! 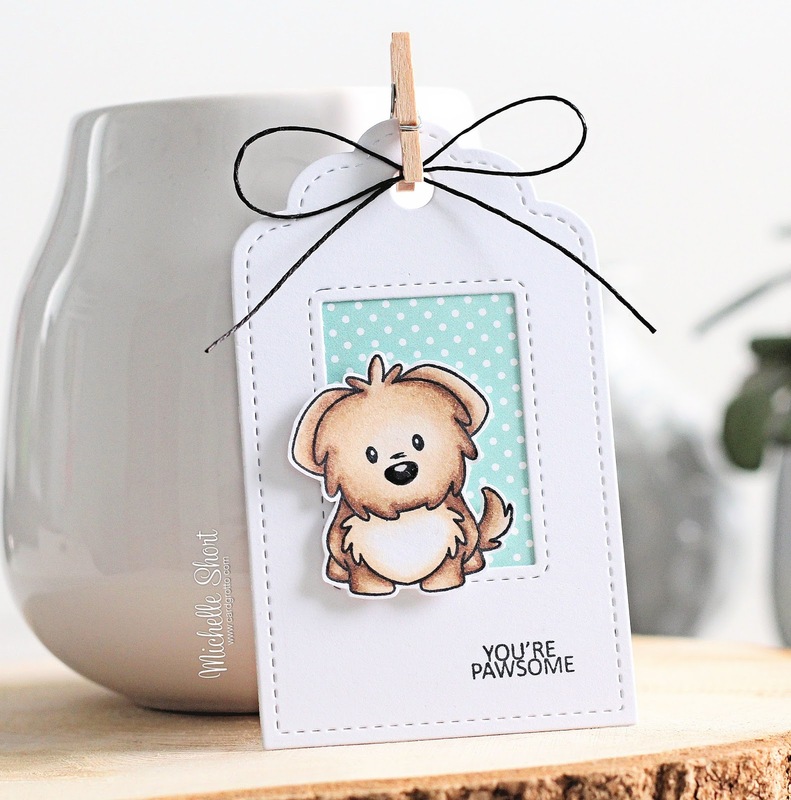 Hello there, today I have a tag to share using the adorable Puppy Love stamp set from Clearly Besotted. I am also using the fabulous Tag Along Die Set, this set is fabulous as you can mix and match different dies to make some unique tags. I started off by cutting the scallop top tag first from white cardstock, I then took the rectangle piece and die cut this in to the centre to create a window. I cut another whole tag from MFT Itsy Bitsy Polka Dot Pastels Paper Pad and adhered the white tag over the top with tape runner. I also added a white one to the back, to finish the back off nicely. I took one of the puppy's from the Puppy Love set and stamped this on to white cardstock with Memento Tuxedo Black Ink. I then coloured him using Copic Markers (colours used listed below the supplies section). I fussy cut him out (there are dies available, I just do not have them yet) and added him to the tag with foam tape. The sentiment was stamped using the same black ink on the bottom right of the tag. I added Crystal Glaze to his nose and then added some twine and a little clothes pin to the top of the tag. COPIC MARKERS - E47, E43, E42, E41. I am not sure whether to keep this as a tag or to add it to a card. For the time being, I like it as a tag :) Thanks so much for visiting me today, I really do appreciate it. I hope you have a wonderful day! I LOVE this adorable tag! You always make it look so easy, but I know it isn't. The pup is cute, but I love how you created the tag and added the patterned paper to give extra interest. He is cute whether you decide to leave him as a tag or make him into a card. Thanks for always inspiring me!